Jalapeño poppers are a very easy treat to make. They are great for appetizers, as hors d’oeuvre at parties, as a dish to bring to potlucks or barbeques. They are little peppers filled with cheese wrapped in bacon. Now some people might be scared to try them because Jalapeños have fame for being spicy. However most of the spiciness is located within the seeds and ribs, so if you clean them really well there is nothing to fear! -1 Tbsp vegetable or coconut oil. Put on your gloves and slice all of your jalapeños in half . Do not separate the stem, it looks pretty with it on and is a nice little handle. With a spoon remove all of the seeds and ribs (the white membrane) inside each jalapeño half. Give them a quick rinse then set them to dry on some paper towel. Clean out your cutting board, discard all the jalapeño guts and your gloves. In a small mixing bowl add the cream cheese, green onions, and pepper. Mix them all together, and set aside. Cut all of your bacon strips in half. Now you are ready to start assembling. Get one jalapeño half, fill with 1 Tbsp of the cream cheese mixture. Make sure you distribute it evenly. Then wrap the whole thing in one of the bacon pieces. Secure with a toothpick. Repeat this process for each one of the jalapeño halves. Note: If you want to start this dish ahead for a party, then this is where you would stop. You should place all of the poppers in a baking sheet, cover them with plastic wrap and put it in the fridge until you are ready to make them. Bake for 5o minutes. As soon as they are out, place them on a serving plate that has been lined with paper towel. You can serve immediately, or let them cool to room temperature. Either way they are delicious! 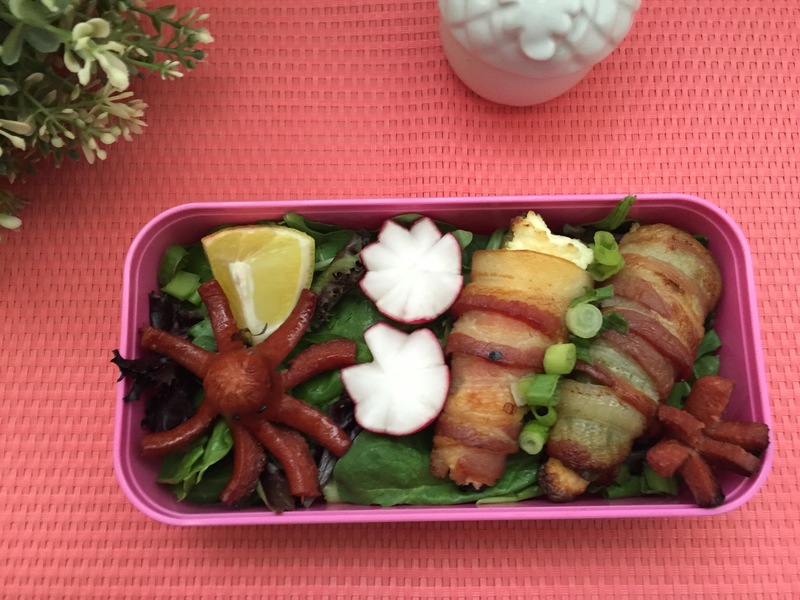 Note: For the bento I just let the poppers cool. Then fill the bottom of my bento box with salad greens. I added radishes, green onions and lemon, all of which will be mixed in when you eat your lunch. The poppers and the sausage can be microwaved on low for a few seconds at a time until they reach a temperature you enjoy.